So it hasn’t been verified, but it looks like Al Qaeda released another video today, attacking Barack Obama and warning of future terrorism and bloodshed. You might be asking yourselves such questions as: If Obama “pals around with terrorists,” why don’t these terrorists want to pal around with him? And what ever happened to that guy Osama bin Laden? Oh, and if this terrorist network was chased into caves in Afghanistan after 9/11, how are they still producing and distributing videos around the world SEVEN YEARS LATER? With this post, though, I wanted to alert you all to another terrorist recruitment video. The evil minds behind this propaganda are airing it on their own network. You might have heard from crazy right wingers that Al Jazeera is terrorist TV. But that’s nothing. There’s a network that is even more powerful, even more freedom hating. In addition to radical programming such as “Puppy Games” and “Meerkat Manor,” Animal Planet is now also airing “Whale Wars.” It’s about the Sea Shepherd Conservation Society and their fight against illegal whaling. 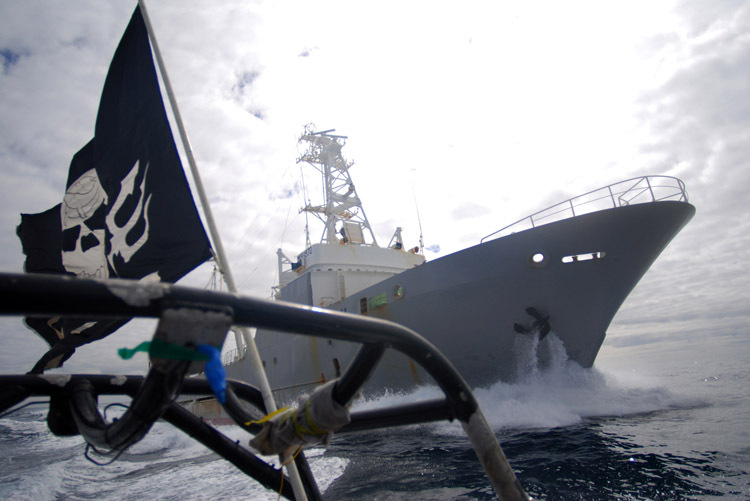 Sea Shepherd has done things like ram whalers, launch rancid crème pie filling onto whaling ships, and generally raise hell any (nonviolent) way they can. If that children’s movie Hoot is “soft core eco-terrorism for kids,” well, this is the real freaky deaky stuff. Remember, these are the same folks that held activists hostage and shot, yes SHOT, Captain Paul Watson, then called the group “eco-terrorists.” They’ve since responded with a series of points about why there was no shooting (some of which seem plausible, especially given Sea Shepherd and Watson’s penchant for theatrics) and a denial of any hostage taking (my favorite justification that the activists boarded the ship with toothbrushes in their possession… which I guess means that it’s ok to hold them at gun point). Perhaps the “Institute of Cetacean Research” would well to check out this latest Al Qaeda video. They might get a better idea of what real “terrorism” looks like.